2. Driftwood – While you could pick some of this up off the beach, you’re better off going through an aquarium dealer. Quarantine the wood in a separate tank for a bit before putting it in with your fish. 3. Coral – If you have saltwater aquarium supplies handy, you could include some living coral in your display. Although the care requirements can be a bit challenging, they look beautiful. 4. Plants< – Your fish are going to want places to hide and plants provide great hiding places. They can be real or artificial depending on how much care you want to give them. 5. Ceramic Items – Any ceramic bowl or dish can be used in an aquarium but you probably won’t want to do anything else with it once you remove it from the tank because of the difficult-to-remove algae build-up. 6. Gravel – You’ll want something to cover the bottom of the tank and gravel can be a good choice. It works well with many filters and can provide a splash of color to the tank. Glass marbles also work well. 7. Sunken Ships and Castles – You can find affordable versions of these fish tank ornaments in almost any store, including larger retail shops. They make a cute addition to the tank and are great hiding places for fish. 8. Stones and Rocks – If you find a particularly lovely rock along the road, you might be able to include it among the fish tank decorations. Just test it with a weak acid, such as lemon juice. If a reaction occurs, don’t add it to your tank. 9. Background Paint – You can choose to paint the back of the tank instead of using a background. Black is one of the top choices but any dark color would do the trick. 10. The Fish – No matter what types of decorations you add, none will be as beautiful or as interesting as the fish themselves so make sure to pick fish you really like and can care for. 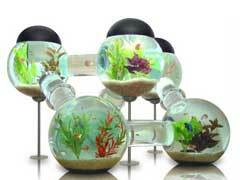 With that advice on some of the best fish tank decorations, you can set up a fun and lovely aquarium for your home.